There are Orbicular jaspers from a number of locations within the Franciscan Formation, from as far north as the Washington state coast, called olympic jasper, and it shows up occasionally. There are several varieties of orbicular that seem to originate from Snow Mountain, up near Stonyford California. Robyn's Poppy is one of these, a variety that I discovered a few years ago, on the next mountain to the east. Then there is Snow Mountain Poppy, that turns up occasionally in the alluvial fans of Snow Mountain, mostly found occasionally in Stony Creek. Another yellow type orbicular goes by the name of Eel River Orbicular, however The Eel River has it's headwaters up in the Yolo Bollie Mountains which happen to be in the northwestern alluvial drainage of Snow Mountain complex. Pope Valley over in Napa County could also be an ancient drainage from Snow mountain, but off towards the southwest. 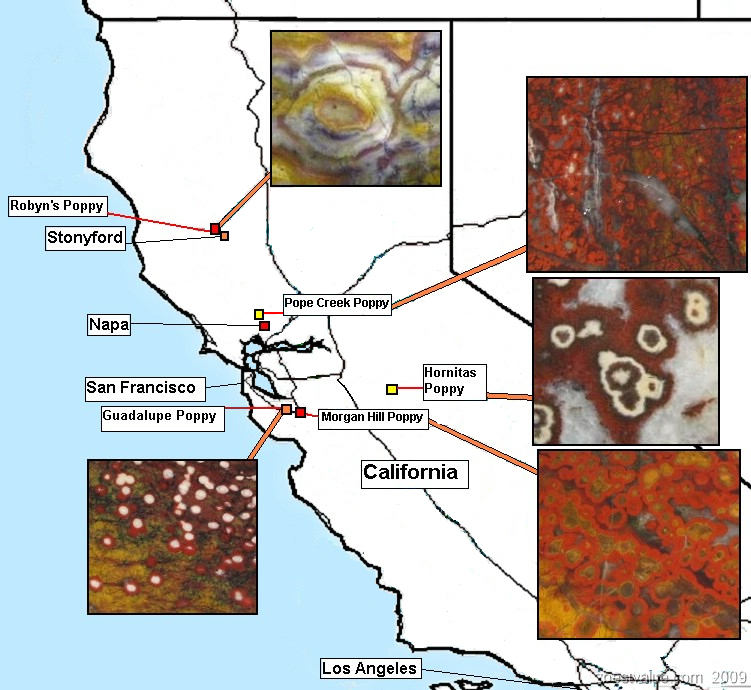 When they were digging down to bedrock to put in the footing for the Golden Gate Bridge on the San Francisco shore, they began to dredge up an orbicular Jasper there, down near the bedrock. The Golden Gate Poppy specimens are mostly locked away in safes now, and are considered treasures, by the few lucky owners. I've seen only 1 piece of that in 35 years of collecting. I have found some examples of tiny colorful orbicular jaspers near Hearst Castle, but I would assume that could have come out of any ocean drainage to the north of San Simeon Beach. Maybe a relative to the Golden Gate Orbicular..., but it should be mentioned that San Simeon beach is actually part of the Pacific Plate, and the border with the franciscan formation is some 25 miles inland, nearer to Parkfield, Cal. The origin of, and nature of orbicular jaspers within the Franciscan Formation is still a source of considerable debate and contention, But nobody would deny that the Franciscan has more than it's fair share of orbicular jaspers. It's been brought up and discussed vigorously, that long ago, when Madagascar and California were both part of the supercontinent Pangea; that they were equidistant from the equator, but on opposite sides, and that they shared much geology and climate similarities, including a massive fault-line structure. The west coast of Madagascar actually ripped away from the ancient continent, and it is that precise coastline that produces the Ocean Jasper. I think that the faultline structure, and the plate tectonics dynamics had something to do with the formation of the orbs.